Default Ticket Type: Select Ticket. 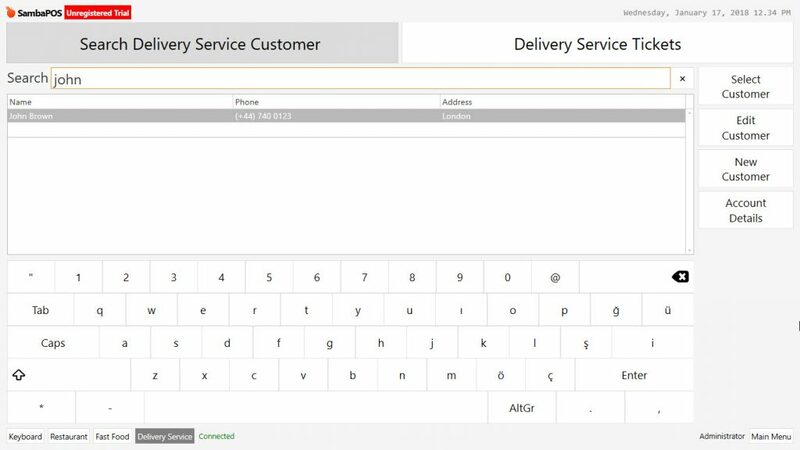 Default Menu: Select the menu to use for delivery service. Warehouse: Select the warehouse that you want it to reduce for sold products from inventories. Price Tag: For the delivery service, if the products will be sold with a different price, select the predefined price tag from here. If the prices will be same then leave it blank. Ticket Creation Method: The field which will be used for selecting ticket creation method. For delivery service firstly customer is selected and then due to order will be received Select Entity option should be selected. After finishing related editings click on Save button. There are some blank data fields. It is possible to fill them according to need. 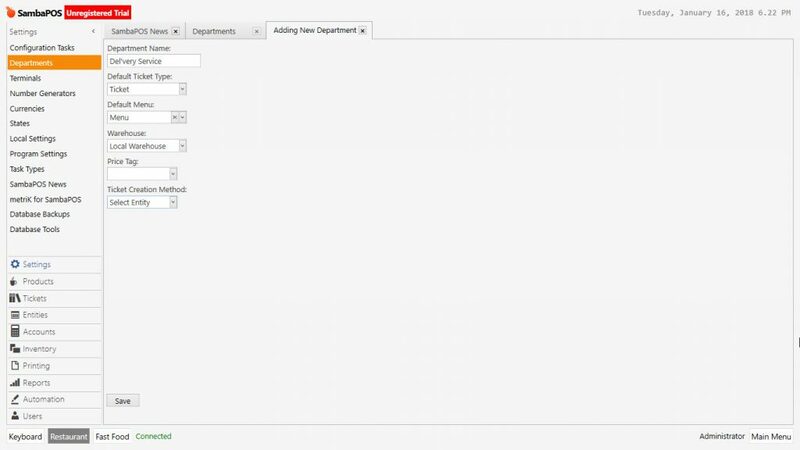 Go to Manage > Entities > Entity Types double click on Customers. In the window click on Custom Fields section. 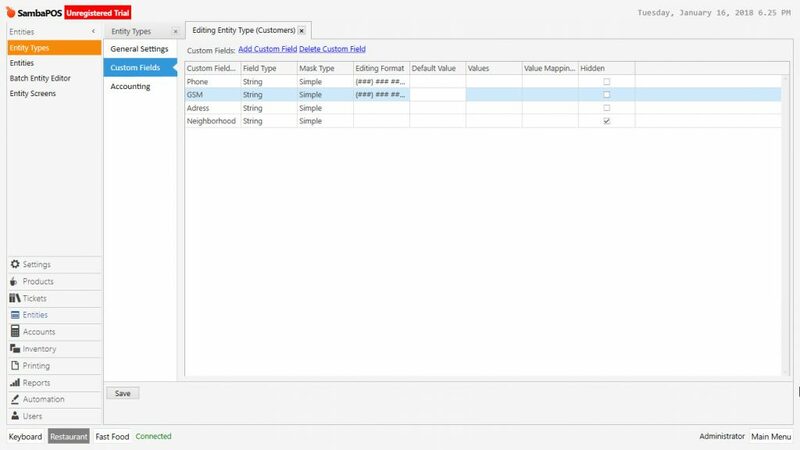 In here click on Add Custom Field section and add row according to customer’s need. In the delivery service department, create 2 different entity screens. 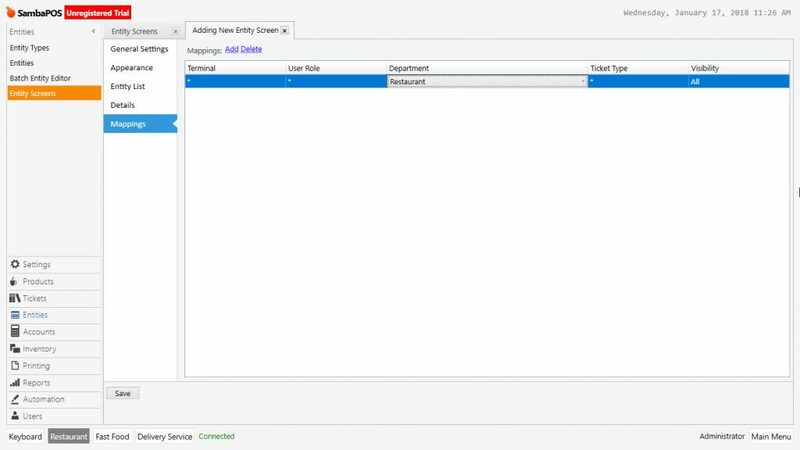 On the first screen search and find the customer, on the second screen see the orders of customers. 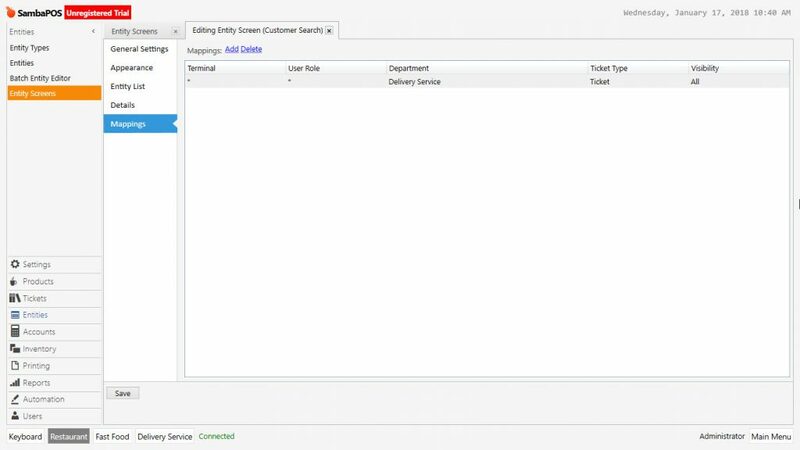 To create customer search screen from Manage > Entities > Entity Screens menu click on Add Entity Screen. Ticket Type: Select default predefined ticket template. 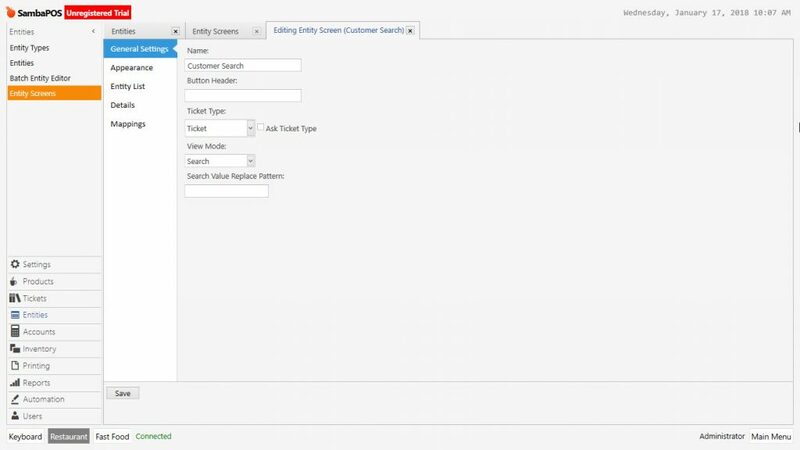 View Mode: In this screen select search template because of customers will be found by searching. 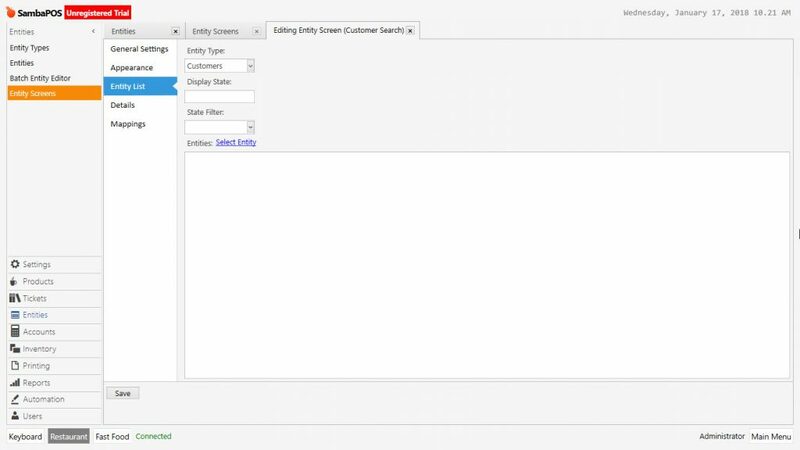 In the entity list select customers as entity type because of searching will be performed amoung the customers. Leave blank other options for this example. Add a row by clicking on Add link on the mappings tab. 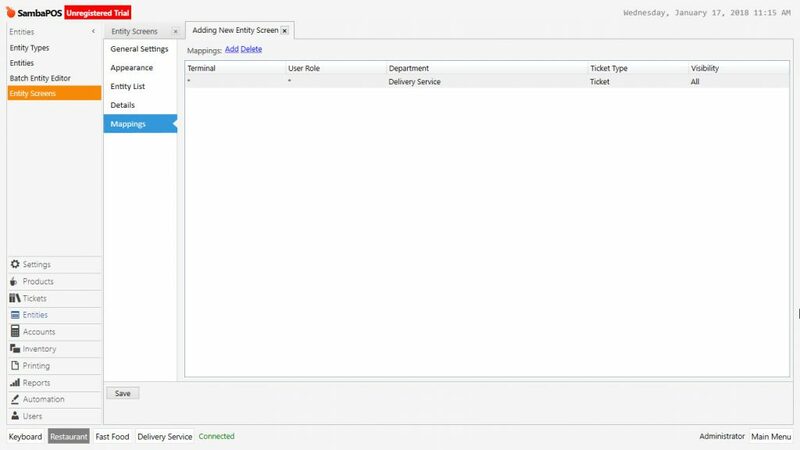 After creating role and terminal, select delivery service on department section, select ticket as ticket type and click on Save button. To create delivery service customer tickets from Manage > Entities > Entity Screens > click on Add Entity Screen link. View Mode: In this screen select automatic to see opened tickets. 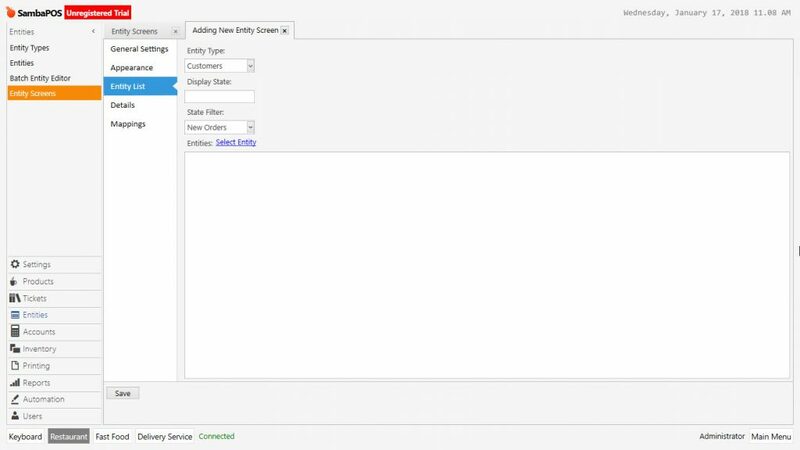 Entity Type: In the entity list at this screen view select customer as entity type to see orders of customers (not table’s). State Filter: Select New Orders. At the mappings tab add a row by clicking on Add link. At the end of related processes delivery service department is ready to use.